Its a Wonderful Movie - Your Guide to Family and Christmas Movies on TV: Christmas Comes to Hallmark Drama, too! * Movieguide Awards coming soon! * Plus, More Movies in Graceland - starting in June! Christmas Comes to Hallmark Drama, too! * Movieguide Awards coming soon! * Plus, More Movies in Graceland - starting in June! Hallmark Drama has announced on their Facebook page - they are getting into the Christmas Spirit, too! "When Calls The Heart: The Greatest Christmas Blessing" will air Wednesday, February 20th, 2019 - at 8:30am/7:30c. on Hallmark Drama AND encore that evening at 9pm/8c.! Please note: The Hallmark Drama schedule is not currently showing Christmas movies airing every Wednesday, but who knows what they'll announce next! 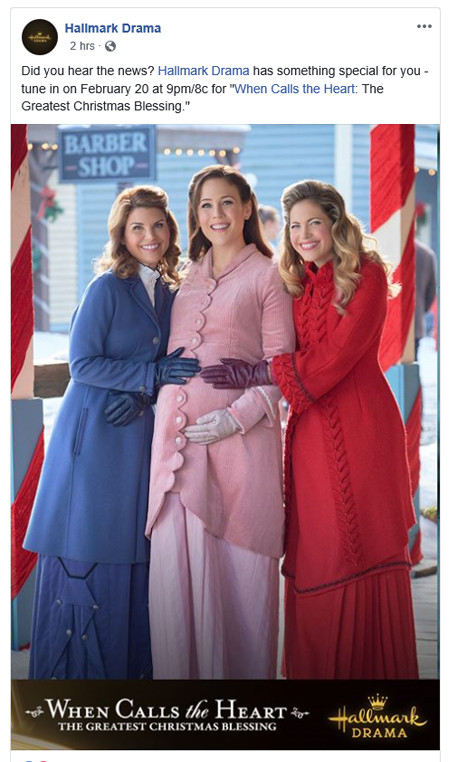 Reminder - this "When Calls the Heart" Christmas movie starring Erin Krakow, Lori Loughlin, and Pascale Hutton (pictured above) is also encoring this Thursday, February 14th, Valentine's Day - on Hallmark Movies & Mysteries! It is truly rare to have any repeat airings of "When Calls the Heart;" therefore, to have this movie air again on Hallmark Drama the following week - is, indeed, a complete, but very pleasant surprise! 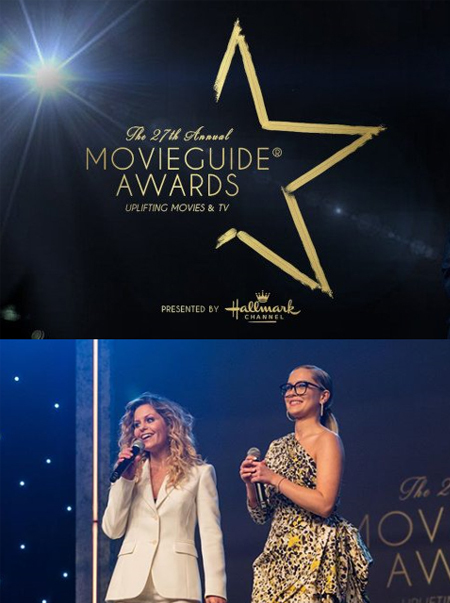 Details via Hallmark: "Honoring the Top Movies for Families and More Mature Audiences, The Movieguide Awards attracts Hollywood's best and brightest and celebrates movies that honor the good, the true, and the beautiful." Put on your blue suede shoes! The movie "Christmas at Graceland" was THE Highest Rated Movie of the Year on the Hallmark Channel in 2018, and it will return this year for a sequel movie in June - "Wedding at Graceland" and another new, currently untitled movie is coming this holiday season, too! This news is according to the Memphis News - commercialappeal.com. 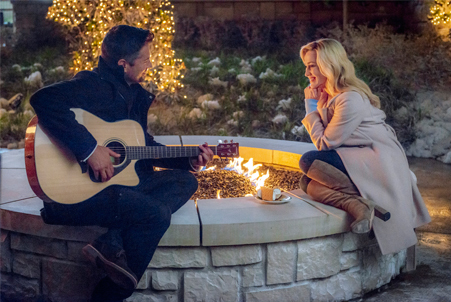 According to the article, "Wedding at Graceland will reunite stars Kellie Pickler and Wes Brown as Laurel and Clay, the former Memphis sweethearts who rekindled their romance during "Christmas at Graceland." Hope you enjoyed all this Hallmark movie news! The When Calls the Heart Christmas movie is airing on the Hallmark Movies and Mysteries Channel on Thursday, February 14th, not on the Hallmark Channel. Net...HMM has When Calls The Heart "The Greatest Christmas Blessing" listed for this Thursday the 14th at 9pm. Is that listing wrong?? That's correct, Joyce. I have them all listed in the New Movie Schedule. Thank you for letting me know my error above. (Bless You!) WCTH is most definitely airing Feb. 14th on Hallmark Movies & Mysteries! Hallmark Movies & Mysteries is showing "When Call the Heart: The Greatest Christmas Blessing" on Thursday, Feb. 14, according to my Directv Guide. I read on Facebook they will be showing Christmas movies every Thursday evening. That's right! I originally posted this exciting news - *HERE*! It's going to be a wonderful year filled with Christmas movies! I will be sharing them all in the Movie Schedule along the way! I am not sure we need another Graceland movie featuring Laurel, I understand the ratings were highest, but I tend to wonder if that is cause there are a lot of Elvis fans and this being in Graceland, and didn't this open and have a special showing at Graceland? I guess we all like and don't like differently and that's what makes us all unique. Love Hallmark Drama getting into the Christmas spirit, I hope it continues. I love all the surprises we have been getting this year with the 10th anniversary. Even though Elvis has been gone now over 40 years, you are so right... there are still many fans today. He certainly did have an amazing voice. As for the movie, I'm sure there will be some excited and those less interested. For me, this was one I personally enjoyed because I love singing! I would love to see Kellie add a little more of her songs in the mix, like "Red High Heels." They should definitely put that one in the next Graceland Christmas movie! I have to agree with Sabrina. I only watched Graceland once..almost didn't make it to the end. I was in total shock upon learning it was the number one Christmas movie for HM 2018. I think like Net said, Elvis is still so loved. I believe that viewers tuned in b/c of Elvis and Graceland. Loved the music and I'm a Kellie fan...after all she is from NC! But that child cannot act! Wes Brown was the saving factor! Maybe the new ones will be better. I think that was it for me too Joyce, love Kellie's songs and Wes Brown is so, well not hard to look at (he's gorgeous). I may not like Kellie's acting, but I read that she cut off her beautiful hair in support of a friend with cancer, that was very sweet. This was a while back, a very touching thing to do. Hey Sabrina, I remember hearing that story about Kellie donating her hair. So sweet! Like I said, I'm a Kellie fan. She does great on hosting shows etc. and can definitely sing. Cheered her on when she was on American Idol, but she's out of her element with acting. Those are good ideas. I like the song Blue Christmas, but I wonder if it seems like a rather sad title for a typical, cheerful Hallmark Christmas movie. They used the song near the end of the first movie - just before they got back together, of course! I love Blue Christmas when they have Martina McBride singing in it with Elvis (I know not with elvis, its added in, but its so good. I love love my country music.